The problem with CG animation is that it relies on the imaginations of actors. You've got to believe they are really 'there', not flailing around in front of a green screen in a crazy MoCap suit. That could be about to get both more realistic and cheaper to produce as VR allows actors into the games or movies. Cloudhead Games, the developer behind the exciting, upcoming VR title The Gallery: Call of the Starseed has used a HTC Vive headset to motion capture an actor's performance while inside the game. Adrian Hough, who has done MoCap work for Assassin's Creed, plays the character of The Watcher in Starseed and for the trial, he performed inside a custom performance rig. 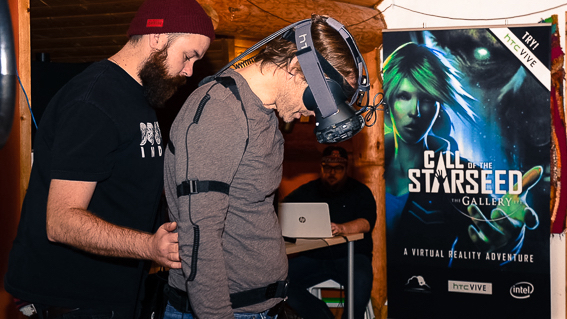 The aim was to capture enough data so that when the player encounters a character in the VR world, it's convincing enough to stand face to face with them. The set up involved Hough wearing a Perception Neuron MoCap suit from Noitom and performing in a 15 x 15 capture space, with moving platforms that reacted to his movements and a cue-card system for his last minute changes to his lines. Audio was captured at the same time and the actor remained immersed in VR throughout the whole scene. In a blog, Cloudhead Games' Mike Wilson posted: "We wanted the actor to feel as if they were acting on a stage, able to see the environment, the Player (we used a stand in model), and experience the space as the character would. "We provided the actor with a real world to perform in, devoid of the strain of an abstracted environment, green screen or real-world distractions. Based on the feedback from the actors, our VR performance method worked extremely well for them." It's interesting to see devs using VR to create games which will be played with this technology. Look out for more news on The Gallery as we get closer to the launch of the HTC Vive and Oculus Rift.